Alvin’s Auto in Oakland, California, has recently gone all green. From the green painted walls in their offices to their staff wearing green T-shirts to three of their cars being branded in the latest Green Recycled Parts logo, Alvin Collier, President of Alvin’s Auto and his staff are excited about the new Green Recycled Parts initiative.“We’ve gone green!” said Collier enthusiastically. “We love this program! We plan on doing a lot more with it. For example, on National Recycling Day in November we’re going to try to use this initiative’s promotional materials and branding to raise our awareness in the community. We are planning on accepting items, such as tires, scrap, oil, and other recyclable parts from the local community for free to try to help them understand what we do in the automotive recycling industry.”Stoystown Auto Wreckers in Stoystown, Pennsylvania, shares the enthusiasm Alvin’s Auto’s has for the Green Recycled Parts initiative. Stoystown Auto Wreckers even used the Green Parts initiative tools in a rather unexpected way – a school project! Since its launch on Earth Day this year, the Green Recycled Parts initiative is gaining momentum with already close to 300 members using the program. The initiative offers members the value-added benefit of having professional advertising and marketing materials at their disposal to help raise public awareness of the industry. The Green Recycled Parts Program or GRP was birthed at the ARA International Round Table held at Coffs Harbor, Australia, in 2009. That’s where the first discussion of creating a central hub for the global branding of GRP occurred. Canada has led the way with their Green Parts program and the Canadian representatives were able to jumpstart the initiative with all the great branding and marketing they had been doing to change the perception of the automotive recycling industry. “The vision behind creating this central hub for global branding was primarily that we wanted to educate consumers so that they could understand two main things,” said Michael Wilson, CEO of ARA. “That we, for decades, have been offering consumers a more affordable and environmentally-friendly alternative to OEM replacement parts. Following the International Round Table meeting, more and more evidence surfaced that a global branding was needed. The industry’s image was under attack. “We spent a lot of effort getting the trademark and as things progressed the Chrysler position paper that portrayed us as junkyards came out, proving all the more that we need to make sure we determine our branding, not someone else,” said Wilson. “Also, during the Cash for Clunkers (C4C) program, I spent on average about six hours a day talking to media and educating them on what we do as an industry. We really saw that, in general, through the media coverage of the C4C, most people don’t understand what we do or can offer the public. The GRP is a vibrant marketing program that will continue to pick up pace. The first phase of the roll-out included tools such as online banner ads, online video, and television ads. These are tools that would be expensive to produce for any individual recycler, but with the GRP program they are available to members at no cost. All members need to do is add their own branding to these marketing tools. The program is open to all members and each member must sign a code of ethics and terms and conditions agreement that will display when they login to the website. The marketing tools are only available for each location that is signed up as an ARA member. For example, if a member has more than one location, the materials can only be used for the location that is registered as an ARA member. To add a branch that is not a member costs a mere $375 per year, which is a bargain when you stack up how much you would pay to produce your own advertising. Guruz Media will launch additional tools at the upcoming ARA Convention in October, as well as offer both a seminar and some small group consultations to GRP members. These consultations and seminars are designed to help members find the best way to fully leverage the potential of GRP. “When you look at how far the Canadians have taken this, there is huge potential for us to expand and tap into international markets as well,” said Reinert. “The program is on the right track and needs to keep moving. The more funding we have, the more we can do with it. As we involve members in programs that generate funds for ARA outside of dues, such as through BizUnite and Wells Fargo, the more we have to put toward programs like Green Recycled Parts. All this will protect our image and our livelihood. We can do so much more to educate the public about our business and to attract potential customers. Doug Reinert and Chuck’s Auto are maximizing their use of the GRP. Instead of spending a lot of extra money to advertise, they are using the marketing tools provided to members. They have the Green Recycled Parts decals on their doors, and they attach the materials to everything they send out to the media (i.e., press releases). They attach it to e-mails they send every day and have it on their websites. They are also in the process of getting an over-sized TV monitor that will run the video in their office. It’s the whole principle of united we stand and divided we fall. We can do more as an industry if we pull together and get behind global marketing and branding of the industry than if we try to do something on our own budgets. Not only does the GRP provide a united effort and face to the consumer, it is also very cost effective. As a member, you have the benefit of using the GRP and customizing it for your market. You have professional marketing tools at your hand that would cost thousands of dollars to do on your own. Branding your business as green has never been easier. Here’s your opportunity to let your local community know what you really do – what are you waiting for? 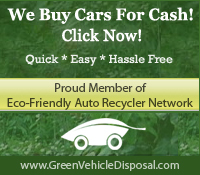 Join other members and go green! Michelle Keadle-Taylor is a freelance writer in Northern Virginia.